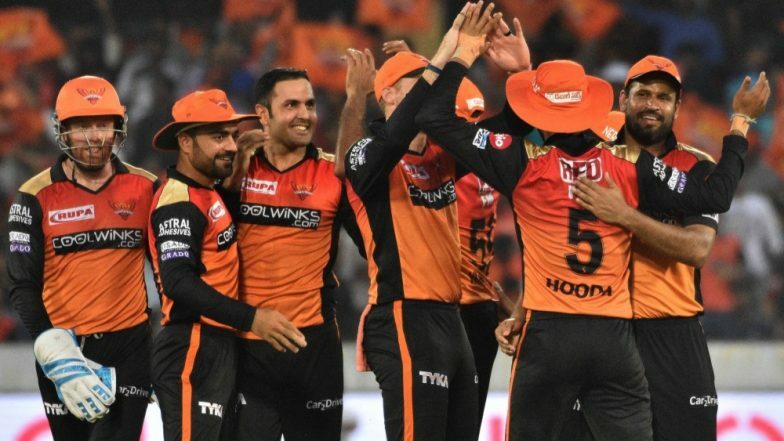 Sunrisers Hyderabad (SRH) have all the reason to stay cheered up following their brilliant performance in the past two matches of the Indian Premier League 2019 (IPL 2019). Sunrisers are ready to lock horns with Delhi Capitals (DC) in the game number 16 of IPL 2019. SRH won their last game of this season against Royal Challengers Bangalore (RCB) by 118 runs. Meanwhile, SRH has shared a video of their players playing pool volleyball ahead of their clash with Delhi.Sunrisers Hyderabad Squad for VIVO IPL 2019 Match 16: Will Kane Williamson Captain the Side Against Delhi Capitals? The Orange army is a strong unit, which features star cricketers like David Warner, Jonny Bairstow, star spinner Rashid Khan to name a few. SRH was the runner up in the last season of IPL, after they lost the final match against Chennai Super Kings (CSK). Sunrisers Hyderabad team have earned four points till now and have lost one match out of the three games played this season. In their last game against RCB, they posted a mammoth total of 231 for two. Both the SRH openers, David Warner and Jonny Bairstow scored centuries in the match against RCB, where Warner scored 100 off 55 balls, while the latter scored 114 from 56 deliveries. From a bowling perspective, Mohammad Nabi took four wickets by just conceding 11 runs from four overs in that same match against Royal Challengers Bangalore.